Also serving communities of Ferguson. There are 10 Assisted Living Facilities in the Florissant area, with 5 in Florissant and 5 nearby. To help you with your search, browse the 17 reviews below for assisted living facilities in Florissant. On average, consumers rate assisted living in Florissant 4.3 out of 5 stars. Better rated regions include Bridgeton with an average rating of 5.0 out of 5 stars. Caring.com has helped thousands of families find high-quality senior care. To speak with one of our Family Advisors about assisted living options and costs in Florissant, call (855) 863-8283. Florissant is approximately a 25-minute drive from downtown St. Louis, making it an ideal location for seniors who want to live near Busch Stadium and the Gateway Arch without dealing with big-city crowds and a hefty cost of living. There are nine assisted living facilities in the Florissant area, four of which fall within city limits. 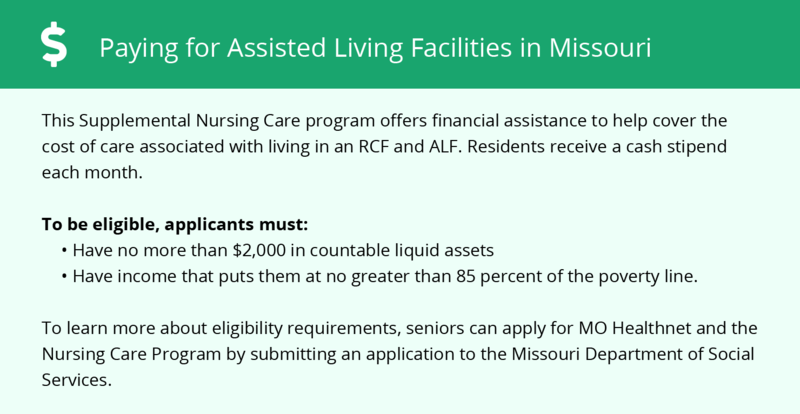 The Department of Health and Senior Services regulates these and the rest of Missouri's assisted living facilities to ensure patients receive quality care. Florissant has multiple public transportation options that cover the city and pass through North County, West County and downtown St. Louis. Options include the MetroBus and MetroLink, both of which offer Senior Reduced Fare Permits. Elderly residents of Florissant can also request rides on one of Florissant’s two 25-passenger buses if they belong to a qualifying organization. Florissant has a higher crime rate than nearly 55 percent of U.S. cities, but it has a significantly lower crime rate than many neighboring cities in North St. Louis County, including Kinloch, Ferguson and Hazelwood. Theft accounts for approximately seven out of 10 crime reports in Florissant, and assaults equal just 4 percent of the city’s crimes. The cost of living is low for Florissant residents, with homes costing less than half the price of the U.S. median. Utility prices are slightly higher than the U.S. average, but Florissant residents generally have lower grocery and transportation costs than other parts of the country. Seniors who appreciate changing seasons will enjoy Florissant's chilly autumns, snowy winters, rainy springs and sunny summers. Temperatures typically range from the mid-20s in the winter to high 80s in the summer, but sometimes they dip below 0 degrees Fahrenheit or soar above 100 degrees Fahrenheit. Florissant has few facilities from which to choose in the event of a medical emergency or illness, with the nearest major hospital located in Bridgeton, Missouri. St. Louis County, which includes Florissant, is a member of the AARP Network of Age-Friendly Communities, meaning that its elected leadership “has made the commitment to actively work toward making their town, city or county a great place for people of all ages,” according to AARP. Assisted Living costs in Florissant start around $0 per month on average, while the nationwide average cost of assisted living is $4,000 per month, according to the latest figures from Genworth’s Cost of Care Survey. It’s important to note that assisted living rates in Florissant and the surrounding suburbs can vary widely based on factors such as location, the level of care needed, apartment size and the types of amenities offered at each community. 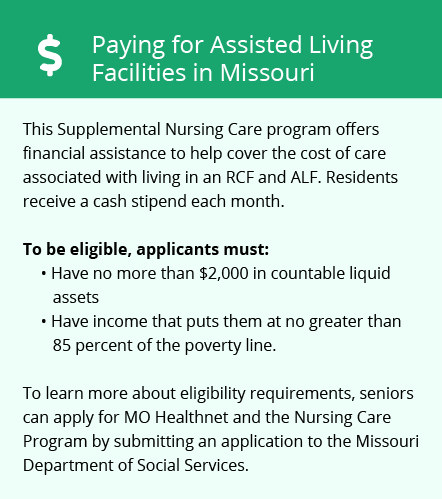 The Missouri Medicaid Aged and Disabled Waiver provides financial help for seniors that covers assisted living costs. There is also a State Plan Personal Care option and Supplemental Nursing Care Assistance Program applies to also both assisted living and nursing home care. Florissant and the surrounding area are home to numerous government agencies and non-profit organizations offering help for seniors searching for or currently residing in an assisted living community. These organizations can also provide assistance in a number of other eldercare services such as geriatric care management, elder law advice, estate planning, finding home care and health and wellness programs. To see a list of free assisted living resources in Florissant, please visit our Assisted Living in Missouri page. Florissant-area assisted living communities must adhere to the comprehensive set of state laws and regulations that all assisted living communities in Missouri are required to follow. Visit our Assisted Living in Missouri page for more information about these laws.